We started off the year with quite a few changes. Our new superintendent, Patricia Sullivan-Kriss, agreed to become the Superintendents representative on the School-Business Partnership of Long Island (SBPLI) board. 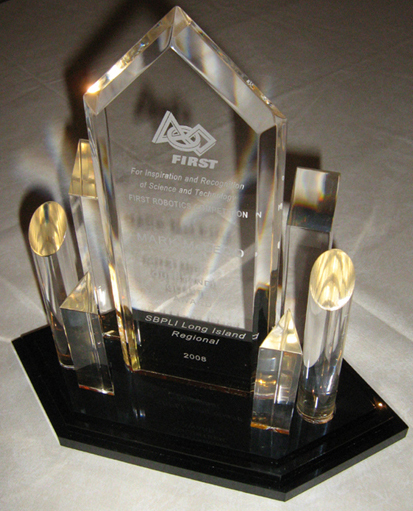 SBPLI is the organization that runs the FIRST Long Island Regional at Hofstra. Ms. Sullivan-Kriss obtained grants for a mill at Hauppauge, complete with tooling, an arbor press, and four new computers for CAD stations. This new equipment arrived during the Summer and Fall (and is still on order), and arrived in pieces that had to be located, assembled, installed... It's great to have some new stuff!! We had several Officer's meetings during September to organize, plan and host a special demonstration for Superintendents and Administrators of school districts without teams and a couple that will be rookies this season. Patricia Sullivan-Kriss hosted this SBPLI meeting at Hauppauge and invited as many school representatives as she could - Brentwood, Connetquot, Copiague, Farmingdale State College, Harborfields, Huntington, Manhasset, Massapequa, Roslyn, Sayville, Sewanhaka, Southhampton, Bellmore/Merrick, Syosset, and others. Team 358 officers demonstrated two robots and described the FRC program and their experiences in the program. 25 new team members signed-up and we had our first all-hands team meeting at the end of September. General membership meetings covered what FIRST and the robotics program is all about and gave the newest members an idea of what to expect. We also covered more mundane topics such as the Fall meeting schedule, club dues, fundraising, etc. One general meeting split everyone into smaller groups then took each group through robot basics in pneumatics, mechanical frame, electrical & control system. Everyone got an opportunity to drive the various robots to get a feel for what's involved, and special meetings were held in advance of our two off-season competitions for everyone to learn and practice with the robot. We held several smaller, non-general, meetings focused on particular aspects of robot development: programming, drivetrain review, and electrical wire stripping/crimping/soldering. Our fundraisers started with flower bulbs closely followed by a Car Wash and car magnet sales. 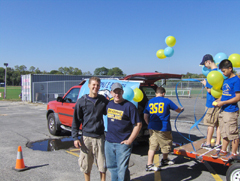 At our Car Wash in the High School circle we netted $577, including $180 in car magnet sales to people getting their cars washed. It was a bright, sunny day of about 80 degrees! Summer extended all the way into October this year. The Deer Park Invitational and Homecoming fell on the same day splitting our attention. The PSAT took all our 10th and 11th graders away for the morning, so we had a skeleton crew much of the day. We modified our 2005 tetra-playing robot to hang tubes and loaned it to a rookie team to play through the qualifying matches at the Invitational. The officers helped setup the field at Deer Park on Friday afternoon making quick work of it with members of several other Long Island teams. It was pouring cats & dogs but we got our rookie robot into the building by draping it with our rain coats to protect the electronics. The next day, Saturday, October 20 was bright, sunny, and warm - a perfect day for a game and parade. We arrived early at Deer Park with our regular competition robot and lots and lots of spare tubes - almost all of which got used to replace tubes popped during the competition. We had plenty of tubes. 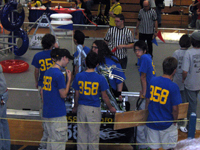 Our rookie 'bot performed perfectly and we had one team member coaching the Sewanaka H.S. rookies and we shared our pit and pit crew with them. 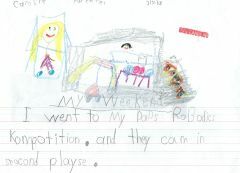 They had a wonderful time and got great exposure to competition. Our regular robot didn't fare so well. It operated just fine, but during autonomous a gas shock supporting our arm kept getting bent forcing the drive team to use the emergency stop and preventing us from moving the rest of the match. At least once the robot was not turned on (oops). It was working by the end, but we lost a lot of driving opportunities for our new team members. "Luckily" we weren't in the finals and packed up quickly to get most of the kids back in time for the Homecoming parade. Several mentors stayed through the Deer Park Finals and helped pack the field away. The Clifford's, using Colin's jeep, pulled the float again with the 2004 robot (in case we didn't get back in time from Deer Park). The parade was great with the marching band (and many of our team members) marching right behind us. We had a table selling our car magnets at the game afterwards. The fireworks finished off a great day. Safe Halloween was next. Terrific event as always with hundreds of kids. The line of kids waiting to play our robot driven game stretched across the room. We were far and away the last booth to shutdown. We'll need to use more robots next year. The canned goods collected as "admission" filled two 4'x8' flatbed hand trucks which were parked in the robotics room until they can be sorted and packed up by Interact for the food pantry. We took about 2 hours at a meeting to take our team photo, then another meeting for driving practice had us replacing the competition robot's shoulder gearbox entirely after it failed catastrophically when we were clearing up autonomous. Luckily, we had a reconstructed spare gearbox that just needed a little work to swap in and everything was operational and tuned up by the end of the evening. Imagine if it had occurred at Brunswick--we wouldn't have had the spare gearbox with us. 1 Pint of green Turkey Hill Mint Chocolate Chip Ice Cream, Funyons, Caramel Syrup, real synthetic whipped cream, topped with Oscar Mayer cold precooked bacon, a large stuffed olive, and a dusting of paprika. For Eliminations we were picked by Team 56--Robbe, Team 75--Robo Raiders, and Team 423--SEC. We won our first Quarterfinal, then lost the next two. Our alliance was better at hanging tubes, but their ramp made up the advantage. Over the summer we received a large donation of 1/8" aluminum from Anorad, a division of Rockwell, so much so that we distributed it to other local teams. The rookie Copiague robot ended up being built almost entirely of this aluminum. We also received smaller parts and even complete linear motor assembilies to use as demonstrations. Our Island-wide programming hands-on workshop was a success and well attended. 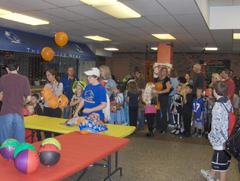 There were students and team leaders from: West Islip, Smithtown, Longwood, Glen Cove, Mt. 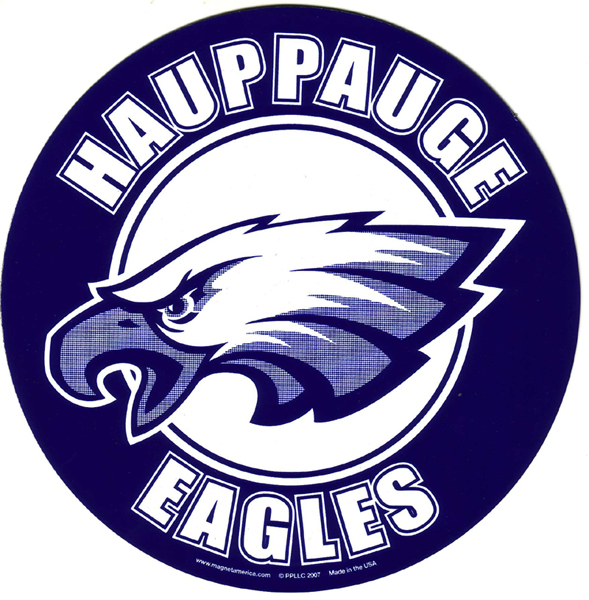 Sinai and others, as well as some of our own Hauppauge students. 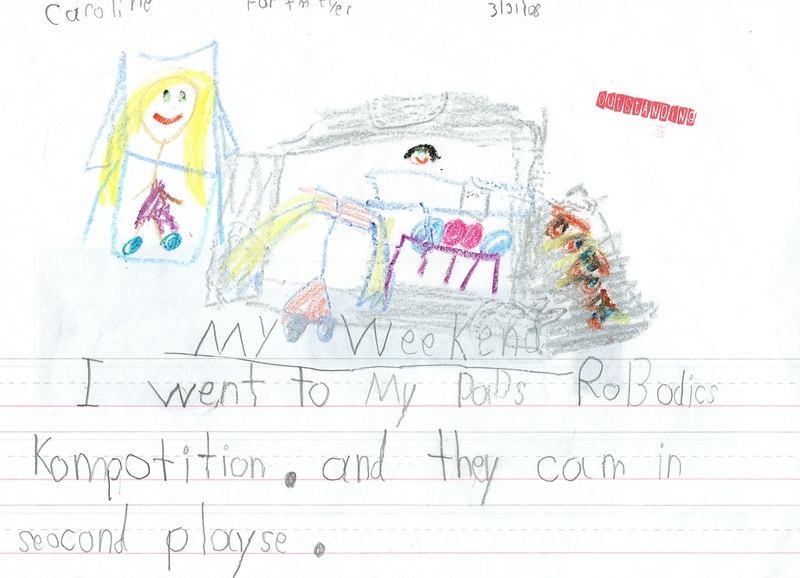 We used two rooms: one for a beginner lecture and the robotics room for hands-on play with robots. Simona Doboli from Hofstra lectured on the basics of C and the robot control system, and Hauppauge adult programming mentors, as well as, experienced C programmers from several of the teams attending, guided beginner programmers in writing their own simple timed autonomous moves on six mini-robots. In addition, each robot had specialty sensors mounted and integrated, so the students could easily add sensor driven autonomous movements. Pat Hughes brought a small, easy-to-assemble demo robot made completely from FRC legal parts that the students got to examine and see in action. Our Oldies concert fundraiser was a success, raising in a single event all the FIRST funds required to register for our 2nd Regional and the Championship. We still need to raise travel funds for Hartford and Atlanta, as well as team T-shirts and give-aways. Our flower bulb orders were distributed at the concert as well. Tickets for a car raffle in conjunction with Sachem are being sold, we have plans for a Spring car wash after the competition season, and our car magnets are still being sold. Our new mill finally arrived in December. Two retired tech teachers, Pat Hughes of Miller Place fame, and Frank Saladino from Plainview-Old Bethpage volunteered to help set it up and instruct us on it's use. We really appreciate the time and effort this took. 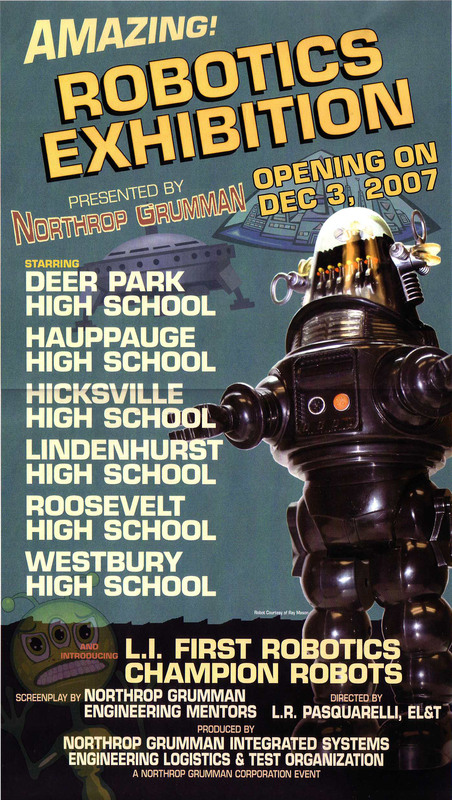 We joined other Long Island teams (Hauppauge, Deer Park, Hicksville, Lindenhurst, & Roosevelt were there) at the Northrop Grumman Robotics Exhibition on December 3. This is an annual event to recruit new mentors to the FIRST cause, not to our team specifically, but to rookie teams and veterans alike who lack professional mentors. We've been pretty successful at hooking up mentors with teams that don't have anyone. Everyone got a tour beforehand of Mr. McLeod's Cyber Warfare Integration Network and the Advanced Hawkeye Integration Lab with presentations on the engineering and projects going on today. For Kickoff we had a packed room to watch the webcast at Hauppauge High School. Our standard Kickoff buffet pop-luck breakfast saw everyone well fed (we do try to eat well and keep up our strength). 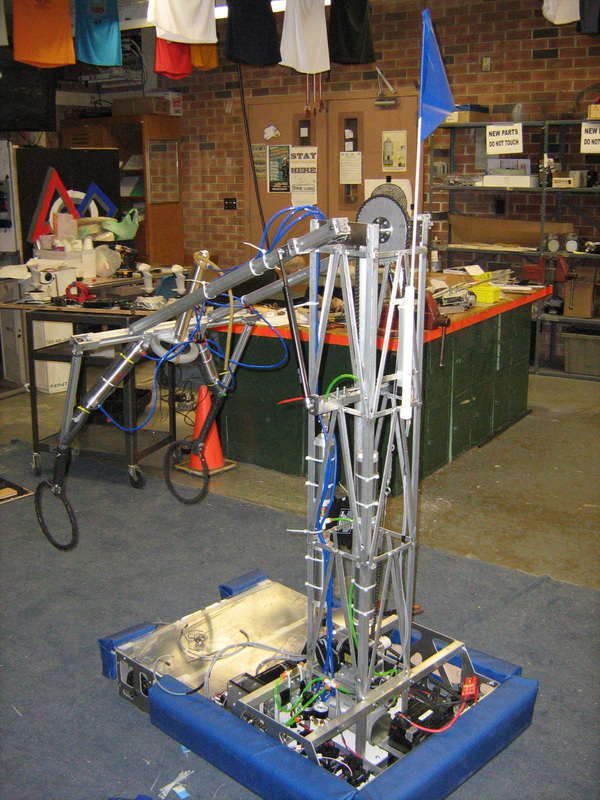 The game was a perfect fit for our big ball handling robots of the past and our 2004 robot was immediately brought out of retirement and pressed into service for prototyping and testing ideas. Mr. McLeod, Mr. Chant, and Mr. Citro were in Manchester for the Founder's Reception at Dean Kamen's home, and the live Kickoff. In January the Saturday after Kickoff we held a Long Island KOP Special Technology Workshop. 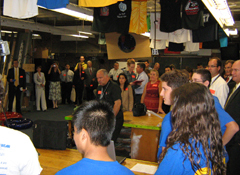 Ten teams attended packing the robotics room with about 30 people. The workshop covered the setup, integration, and use of the Infrared Remote Control FIRST released to us in December just before the holidays. We discussed limitations, drawbacks, and alternatives as well. The IR sensor was demonstrated on an EDU mini-robot, and we wired up and tested all the boards brought by teams. We decided we wanted to build a big ball handler, and we got it designed and manufactured in record time. In part due to our finally being able to mill the parts we needed, and in part due to the dedicated sponsorship of Fonar, Festo, and East/West Industries. We had a whole week for the potential drivers to try it out and experiment with it. Programming got it for a whole day and a half! Our hybrid/autonomous strategy is to be capable of either knocking off the big ball or grabbing and controlling it. If our alliance partners need us to, we can also just do a lap around the field. It's geared to do ~9 feet per second with the big ball. The robot went into the crate ready for inspection right out of the box at the Regional. Driver tryouts had a week of using the real competition robot AND they had a practice robot (from the similar 2004 game) that could play the game as well. 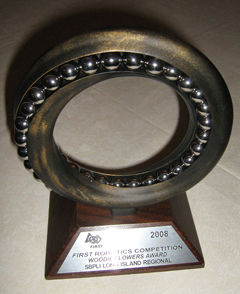 After the robot shipped the drive team competitors did their timing trials with the 2004 robot. 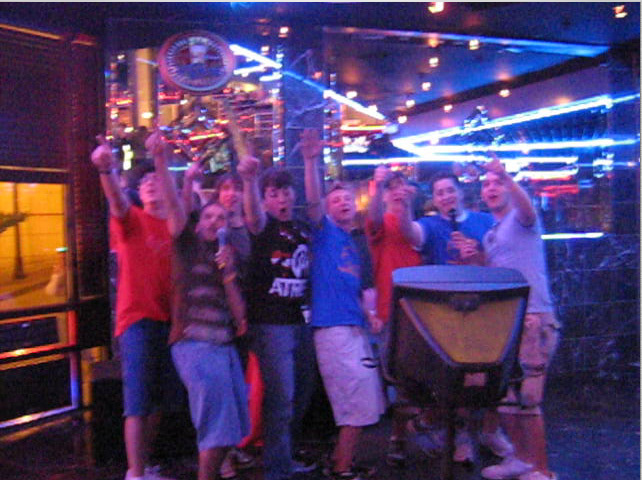 This was the best year, just ahead of 2005, for being able to run driver tryouts. Our drive team became Jimmy McMahon-base, Evan McLeod-arm, Chris Fortmeyer-coach, and rotating human players. This year our coach training waS also improved by choosing our coach early and having him attend the 1st week regional in NJ to see the game up close as it gets played in the finals. The Connecticut Regional tested our design and trained our new drive team. Our robot performed well. There were programming issues with a broken drive encoder and scrambled readouts from the field position, IR receiver, and autonomous switches, so we didn't know what the robot was going to be doing during hybrid mode. However, after straightening all that out the robot did well in moving across three lines during hybrid and the IR receiver itself worked well. Picking a ball off during hybrid was not as successful on the field as it had been at home. Mechanically, the arm gearbox developed a lot of slop by the end of the day and the drive team had to resort to manual arm positioning. Hurdling with the kicker really deteriorated when it became detached on one side and the kicker cylinder was damaged against the rack. We advanced to the Quarterfinals when Deer Park (270) chose us as their third pick along with the Techno Ticks (236). SBPLI Regional: Past team member Matia Eichier composed a piece of music that won the SBPLI Musical Theme contest! 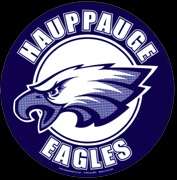 The Hauppauge concert band played at opening ceremonies, and our Superintendent, and many Board of Education members came to celebrate with us. Mr. McLeod won the Regional Woodie Flowers Award thanks to Derek and Ben. He was also awarded Outstanding Volunteer of the Year. Our team and the alliances we were on performed really well ranking us between 2nd and 4th place for most of the qualifying matches, finishing as captain of the fourth alliance. Our scouters chose Lindenhurst team 533, and Port Washington Team 1803 to join us in our alliance. We fought our way to the Finals for another year finishing as Silver Medalists!!! Four years straight of Finals for 2 golds and 4 silvers. On to Championships in Atlanta !!!! We decided to remove the kicker and rework our hurdling. The kicker would work really well one match, but not the next, so it was too finicky. The plexiglass protecting the electronics need too much protection itself as it broke before we shipped, broke in Connecticut, and broke again on Long Island. 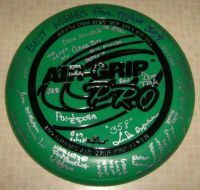 We replaced it with 1/16" lexan and that ended our troubles. Welds and rivets pop every couple of matches, but the rivets are so easy to replace that they turned out to be a great solution. We finished Curie in 20th place after coming back from dead last (84th). We were too polite in our first match, pulling back to clear a traffic jam, and another robot snagged our arm and pushed us over. We missed our second match due to a change in match times, but the five subsequent matches were played normally. 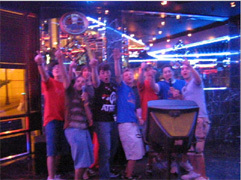 Our last two matches on Saturday in particular were outstanding examples of what our drive team was capable of. Team 203 from NJ presented us with a team award for "Super Alliance Partner" after we paired with them to beat some of the best robots there. FIRST also distributed thanks to mentors by way of certificates and pins. Our year-end debrief meeting was held to cover what went well, what could be improved, what we'd like to try next year. 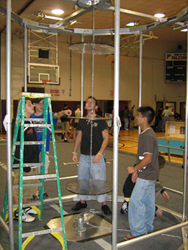 We supported School-Business Partnerships of Long Island (SBPLI) - LI FIRST with an all-day robot demonstration at the Hauppauge Industrial Association Trade Show on the campus of Suffolk Community College where we used to compete years ago. Luckily the show fell on a day the students had off from school and groups of them rotated throughout the day driving the robot and talking to folks who stopped by. There was also an FLL tournament table and a Lego robot setup. We had lots of visitors. Plans have been discussed with the new officers for the rest of this year with an Italian Ice sale and a car wash in the works. The position of Secretary ended in a tie, so we'll hold a runoff election for just that position the day after the team dinner. The team dinner had hero's and dishes families brought in, including a ton of desserts. Gifts from the students to the mentors were a combination desk clock/calculators/pen & pad engraved with "Hauppauge Robotics Advisor" (or Mentor), the principle Booster parents were presented with bouquets of flowers, seniors received signed team photos and signed frisbees, all team members got certificates of appreciation with a small team photo and this year's awards on them. We finished off with a slideshow of the year that closed with video of the student mass Karaoke in Atlanta. We finished the school year with a visit we promised to the Board of Education where the team was introduced and the robot was demonstrated up on the high school stage where the BOE meeting had been relocated. We held an after school Italian Ice sale, but the car wash we planned for the last week of school fell through. We have signed up for two Fall off-seasons, Deer Park Invitational-Oct. 25 & Brunswick Eruption-Nov. 1.